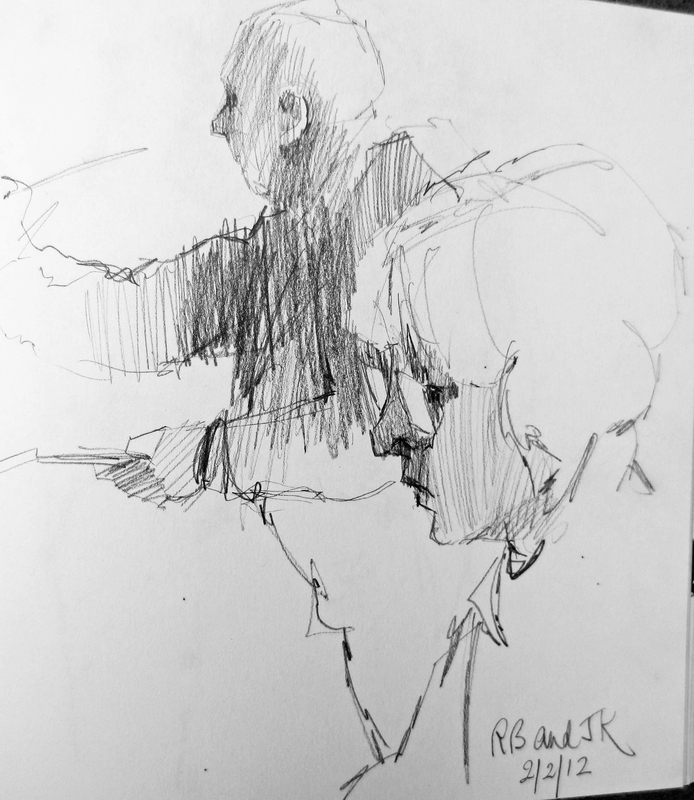 “My sketchbooks are filled with diverse drawings, but here I’d like to focus mainly on people observed in passing, as well as subjects in the Life studio, where I use the sketchbook for preliminary studies or rapid poses. My favourite format is square, with paper robust enough to take a bit of watercolour, and with a stitched binding, so that I can expand across two pages when I want to. I work fast, and I don’t fiddle with life sketches; they stay the way they arrived on the paper. Sketchbooks are fun to look at because they record immediacy. Out and about, I like to draw whenever I can. I explore the way figures form interesting compositions as they recede in perspective, also the extraordinary differences between figure types and shapes. Travelling by train or bus, I will often draw from the reflection in the window in order to avoid detection! 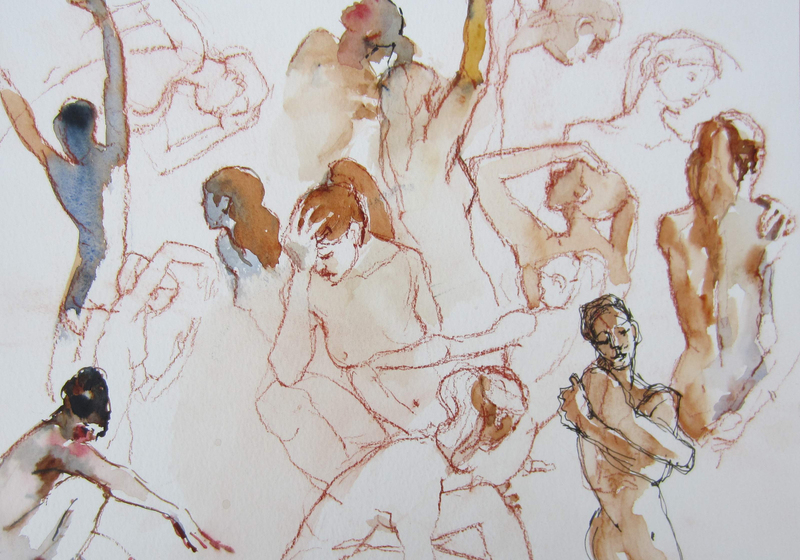 I paint and draw regularly with life models, using them as subjects for fully developed work. 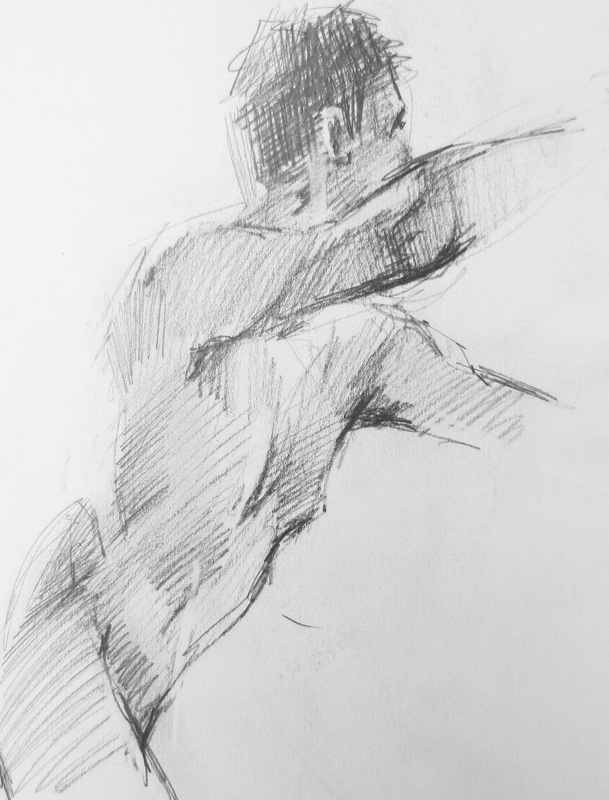 The sketchbook is my preliminary tool for moving poses – sometimes less than a minute – and for difficult or dramatic poses that by their nature cannot be held for long periods. Marion Wilcocks SGFA places drawing at the heart of her work. 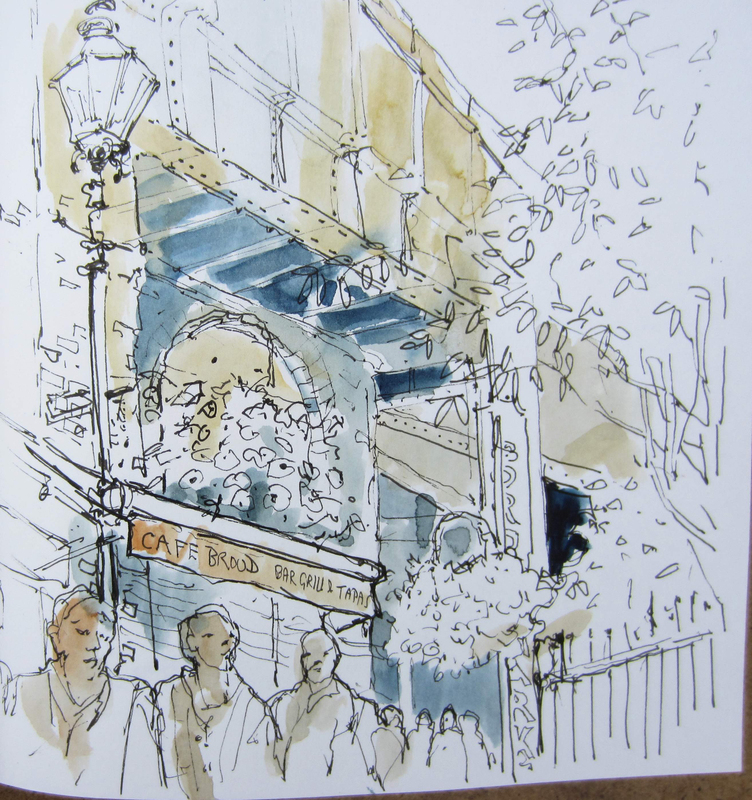 Having originally trained at Cardiff College of Art, she has also studied at the Sir John Cass School of Art, the Prince’s Drawing School and the Slade summer school, all in London. This entry was posted in The Sketchbook Series, Uncategorized and tagged Cardiff College of Art, Chelsea Art Society, life drawing, Llewellyn Alexander Gallery, Lloyd's Art Group, Lloyd's of London, Mall Galleries, Prince's Drawing School, Sir John Cass School of Art, sketchbooks, Slade, Surrey Artists Open Studios, watercolour. Bookmark the permalink. What fabulous work. I love the idea of drawing the reflection in the windows so that she cannot be detected by the subject! Fabulous work indeed — we loved that useful tip too. Thank you for following our blog (and keep up the great work yourself). I enjoyed this succinct window into an accomplished artist’s approach to her work. I’ve even signed up to receive future entries. That’s great news, Sibyl. Thank you very much for your delightful comment — and welcome to the fold! The drawing-from-window is a great idea! Staring at strangers can get awkward…. (shockingly 😀 ). You are so right. I hope you’ve had a chance to try Marion’s tactic for yourself? Yes it works well. 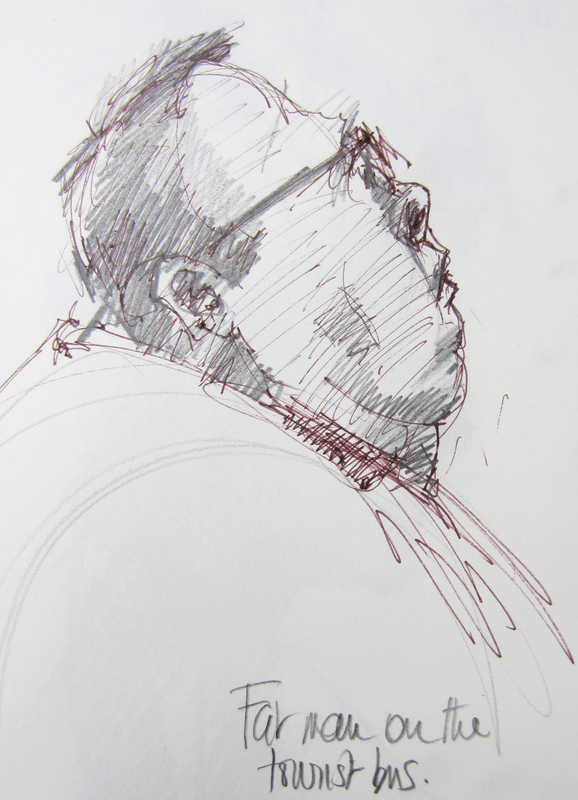 But when a friendly stranger comes to sit beside you and looks pointedly from sketchbook to subject, you’re done for! Haha, that’s something I would do! Or, if that happens, you can just start drawing the person. They’d probably enjoy it! Reblogged this on Unexpected random creativity. Thank you for the extra PR! Your blog looks interesting. What a blessing to have found your blog today. I absolutely am in love with your sketches. As a beginner at sketching and watercolor, your sketches represent the ability I want to accomplish with practice. I can’t wait until the weekend, away from writing assignments, to practice everything I’ve learned so far… and to emulate your quick and beautiful capture of fast changing scenes, and moving objects. Thank you. You’ve been an inspiration today, and will remain one for a long time! Thank you for those nice comments. When I was at college they told us to draw EVERYTHING! Don’t wait for the right subject, just use whatever is in front of you. Good luck! I’m in awe! These are incredibly beautiful. They are beautiful, aren’t they? Marion has a great gift. Thank you very much, on behalf of Marion and the Society of Graphic Fine Art – The Drawing Society. It means a lot to be singled out in this way, especially when it comes as such a surprise. I found this artist on freshly pressed today. Great work. That is most kind of you to bring Marion’s work to a new audience — thank you! Many thanks indeed. Lovely blog! Stunning … utterly stunning. I love how you’ve capture an almost mask, necessary for performers. Brilliantly done; Congrats! I’m sorry I pushed the post button before I could finish. Thank you for artwork. They are beautiful! We do love to read comments like yours — thank you very much for letting us know that Marion’s art touched your life. Nice artwork you got there. 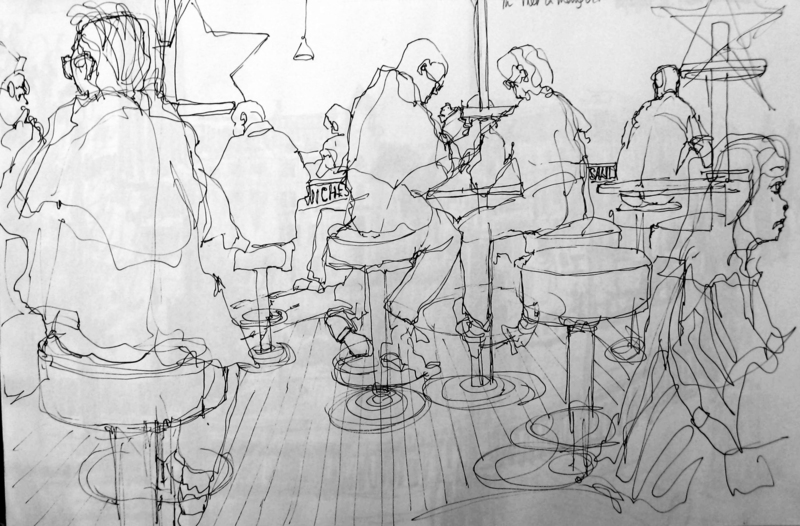 I love the way you capture a scene – cafe or whatever. There is such life and atmosphere. It must be such a joy for you. Thanks. 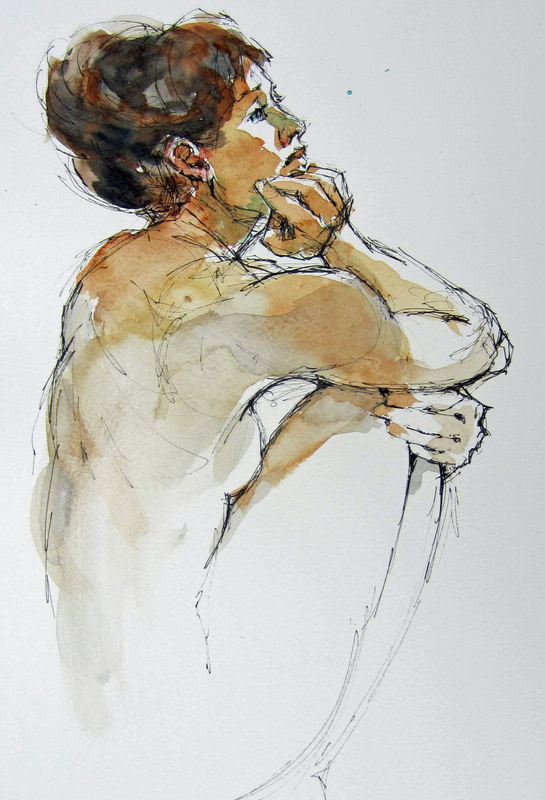 Love the Pen and Wash drawing, I wonder what the lady is pondering about! your drawings transmit a lot of emotions. I particularly like the watercolour ones. Thanks for sharing! I too am in awe of such beautiful creative talent – glad I found you – thanks for bringing a lovely creative light into my day …. Thank you for reblogging Marion’s story. And yes, do carry a sketchbook and draw! fantastic sketches!!! thanks for sharing and congratulations for being freshly pressed. I’ve come across these Marion Wilcocks’s sketches on the WordPress site, they are simply stunning! I enjoyed your sketches, especially Cafe Brood. You have quite a talent. I think it could go even further; I mean your talent seems to go forward, not backward. Hello, it seems that reblogging only works within the WordPress.com blogs and not to websites hosted elsewhere, so unfortunately the link to my reblog on WhichHatTday.com (above) leads to an empty page… So sorry about this, I really wish I could have reblogged these sketches! Thank you very much for trying, Beata. And for taking the time to comment on Marion’s story. My pleasure, Cynthia. Marion is such a gifted artist! Marion is my lovely sister in law who hasn’t shared with you being the brilliant illustrator of ‘Lennie’s Ride’, my published story of a nine year old boy who rode his pony almost a thousand miles here in Australia to witness the official opening of the Sydney Harbour Bridge on the 19th March 1932. This is remarkable. I’ve just found your web site with a link to the book. What a story, and what a great cover. Thank you very much! How lovely to meet my sister-in-law online! ‘Lennie’ was huge fun and of course most of these illustrations are also shown on my website. Oh, wonderful sketches! Beautiful art…. I couldn’t agree with you more, Rachelle. As an artist myself, I greatly appreciate the work I see here. I look forward to visiting again. Henry, thank you very much. We look forward to your return. WOW! That is a great style! I wish I could form my own style as well! Simple. Rapid. Just the right amount of color. Love your work! Thanks for the tour. Thank you for those comments Ed. Lovely sketches. 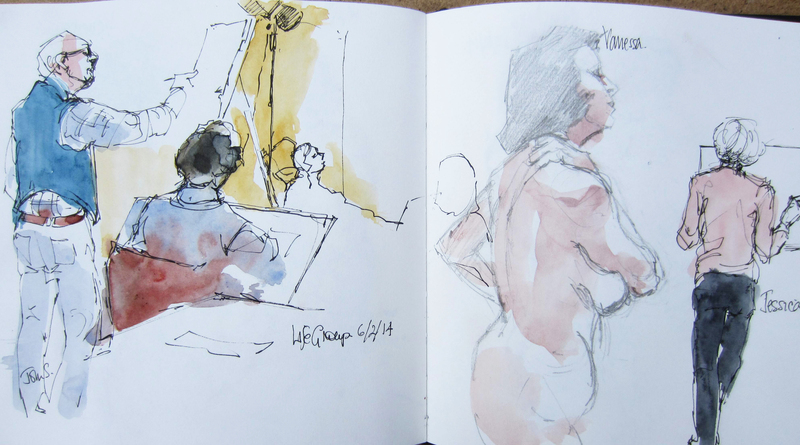 Are these mostly studies or they more so like travel journal drawings? Either way they are nice. We thought so too! Thank you for your feedback. I really loved these sketches. I often feel that sketches are able to capture the essence of a subject in a ways that ‘finished pieces’ do not. Such a privilege to be able to look through an artist’s sketchbook. Jem, I think you’re right. It’s a challenge to retain the immediacy of a sketch in more polished works of art. Thank you for commenting on Marion’s splendid work. Thank you Jem and Cynthia! Also I find so often that after a trip away it is the sketchbook that brings back more immediate memories than do any photographs. I think it’s because drawing makes us LOOK harder. Rebekah, that’s great news. Marion’s work inspires us all!